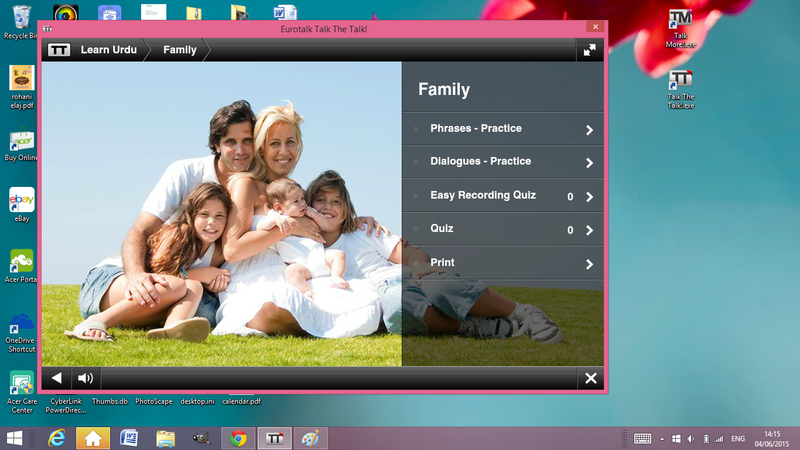 A while ago I've been invited to try out the language learning softare provided by EuroTalk. They started 20 years ago, offering the software for learning European languages, but adding more over the years they now offer over 130 different languages. I've been looking at some good and not too pricey Urdu course for quite a while now, so I was delighted to get the opportunity to try the EuroTalk software! Yeah, I got myself couple of books recently, but I think it's hard to learn just using the book, especially when you want to learn to actually talk in the language. I believe listening to a native speaker helps a lot with correct pronunciation. You could say that having a native speaker at home I could learn from him, but I'm a bit of a weirdo - I really don't like the fact that I'd make a mistake and make a fool of myself (that's why I didn't attempt to talk more in Pakistan). Plus my Hubby is not exactly the most patient person in the world ;) So the software I received is exactly what I need to learn to talk. I received two programmes: Talk More and Talk the Talk. They are both at beginner+ level, perfect for someone who knows some basics but doesn't feel too confident speaking (sounds exactly like me ;)). They aim to teach you full sentences, rather than individual words, and help build confidence speaking the language in various social situatons, like between family/friends, shopping, travelling or emergencies. Both programmes offer ten learning sections to choose from, with Talk More also including the alphabet to teach you about individual sounds. What's great about the alphabet section, is that it shows you the letter in Urdu, followed by the example word. What I would like though is the Urdu symbol transliterated into a letter from the English alphabet as well, as it's a little bit of a guessing game. On the plus side, however, with an image in the background we can learn a few additional words. Each learning section is again divided. First we get to learn the phrases and listen to sample dialogues. These are followed by quizes, which allow us to test the vocabulary laernt. The recording quiz is great for practising the pronunciation, as it allows to compare our own speaking skills to those of a native speaker. You can also see the "print" section - it contains printable vocabulary sheets which you can keep with you. I really like this option - I personally like having a printed version I can write my own notes on, like simplified pronunciation etc. I really liked the way the phrases are presented to the learner. After clicking on a phrase in English on the left, we get an image illustrating the situation, with Urdu translation of this phrase - unlike the alphabet, where this feature was missing, we get both Urdu script and the transliteration. Then we get the sentence read out loud by the native speaker, so we get to listen to the proper pronounciation. I must say I really like the EuroTalk software, and even my Hubby was impressed with it ;) It has a good selection of phrases and dialogues covering the everyday situations. It works on a point system, rewarding the learner with awards for completing the quizzes - it really does keep you motivated when you see how well you're doing! The EuroTalk software is available in different formats: instant download, CD-ROM, and USB plus tablet app. It's also available as a mobile app, so you can learn anywhere you go! You can get the software for your chosen language HERE, starting at just £29.99 for the instant Talk Now download. Disclaimer: I received the Talk the Talk and Talk More software from EuroTalk in exchange for an honest review. All feelings and opinions expressed in the above post are my own. I have seen a few of these before and they do look interesting. I'd love to master a new language. This program looks very interesting, things have come a long way since those cassettes you had to listen to and repeat over! I'm really showing my age now. I've always thought the best way to learn a language would be in a class, but this looks like it could work just as well. I love travelling but I'm not the best at learning languages. This looks right up nh street, I need all the help I can get. This is a great idea. I like learning languages but I've not heard of these courses. I learnt French at school but have forgotten most of it other than a few phrases. This sounds like a great way to learn another language. I love learning languages. When I have more time I'd like to pick Italian and French back up again. What some fun sounding software - I have to admit I'm not very good at learning languages. I love the idea of learning a new language and this course looks really accessible for everyone. I would absolutely love to learn a new language and this looks great. I really wish I was better at it, but maybe I haven't found the right way to learn yet. Sounds like a really useful tool for learning a new language - something I really should do! We're the same. I know a little but can't construct a proper sentence yet. Haha! I'm Filipino but I'm into learning other languages, Right now, I'm enrolled in http://preply.com/en/skype/english-native-speakers to talk with English native speakers. I'm planning on learning Urdu next then French.